The aim of this study was to identify the minimal clinically important difference (MCID) in the Oxford knee score (OKS) and Short Form (SF-) 12 score after total knee arthroplasty (TKA). 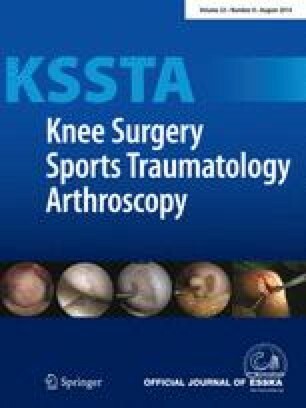 Prospective pre-operative and 1 year post-operative OKS and SF-12 scores for 505 patients undergoing a primary TKA for osteoarthritis were collected during a one-year period. Patient satisfaction with their (1) patient relief and (2) functional outcome was used as the anchor questions. Their response to each question was recorded using a 5-point Likert scale: excellent, very well, well, fair, and poor. Simple linear regression was used to calculate the MCID for improvement in the OKS and physical component of the SF-12 score according to the level of patient satisfaction with their pain relief and function. The OKS improved by 15.5 (95 % CI 14.7–16.4) points and the SF-12 physical component score improved by 10.1 (95 % CI 9.1–11.2) points for the study cohort. The level of patient satisfaction with their pain relief and function correlated with the improvement in the OKS (r = 0.56; p < 0.001, and r = 0.56; p < 0.001) and the physical component of the SF-12 score (r = 0.51; p < 0.001, and r = 0.60; p < 0.001), respectively. The MCID for the OKS was 5.0 (95 % CI 4.4–5.5) and 4.3 (95 % CI 3.8–4.8) points and for the physical component of the SF-12, it was 4.5 (95 % CI 3.9–5.2) and 4.8 (95 % CI 4.2–5.4) points for pain relief and function, respectively. The MCID identified for the OKS and SF-12 physical component score after TKA is the best available estimate and can be used to power studies and ensure that a statistical difference is also recognised by a patient. Retrospective diagnostic study, Level III. An erratum to this article can be found at http://dx.doi.org/10.1007/s00167-015-3959-z. The authors declare no conflict of interest with the content of this study.